If you want to lose weight, you need choose a diet plan and a fitness routineto make sure that you’re burning fat and building muscle. You need to take action and have a plan. I am going to touch on the fact that choosing the best gym center for you, meaning one that is convenient to go to and you feel at ease when you are there, will improve your chances of overall success. Gyms come in all shapes and sizes, and there are probably a number of gyms in your area. Joining a gym can be expensive, so it is important that you careful consider all of the gyms near to your home in order to pick the very best one possible to meet you weight loss and exercise needs on a daily basis. 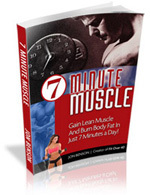 Click here to discover a 7 minute workout that will get you results guaranteed! A very important thing you should consider when you are looking at gyms is the trainers. If you’ll be taking a class or working with a personal trainer, you’ll want to be sure that you’re working with someone who is experienced and will teach you the best habits possible. Unfortunately, there are no set qualifications for trainers, so you should check out gyms that do require training programs of their trainers, also it never hurts to ask for references. The best gym center for you is the one that you feel comfortable with, is affordable to you and has qualified, motivating and friendly staff. You should also look at the equipment available for your use and the hours the gym is open. A gym that only has limited number of commonly used equipment such treadmill may not be the best choice, since you may find yourself standing in line for equipment during peak hours. You may also find that your exercise routine is disrupted if the gym is open only short hours or has limited schedule during the weekends. It is very important to find a place that will allow you to have a great workout at a time of day that is convenient for you. Cleanliness should also be of concern. The best gym center will provide a tour of their facilities at the very least, or a free trial to check out the gym’s space on your own. If a gym is dirty you could be susceptible to illnesses as they spread among members at the gym. It is a known fact that high traffic places like gyms are hotbeds for transmitting bacteria and viruses is no proper hygiene is present. The facility should have a cleaning crew to make sure that the locker rooms are clean, as well as provide antibacterial products to wipe down the machines after workouts. Organization is important too—you don’t want to be tripping over weights that are lying on the floor or feel cramped in a sweating high-volume area. There should be enough space in between the gym equipment and a well organized area for the weights. The best gym center will encourage behavior among its members, where it would be common practice to sanitize the equipment after each use and place all equipment used back to its proper place. Lastly, you should check out prices. The price should be competitive and most of all affordable to you. Most gym memberships are by a set term such as a year at least or two, three years,etc. Signing up for let’s say 3 year term is not necessarily a bad thing since you usually get a better rate and not only that but it generally makes you more committed since now you have a serious investment. Of course you do what works for you. You may end up spending hundreds or thousands of dollars on your gym membership, so it is important to find the best gym center for you the one that best suits your needs. Look at the ones closest to your home, but also consider those a bit farther away if they seem to fit your needs better overall. Disclosure: The website owner earns commission if you decide to purchase any product recommended here.